Although I do appreciate Prince's contribution to music, I can't exactly say that I'm a big fan of his. I am, however, a huge fan of Prince's favorite color: purple. As you can see, my look below features several purple accents; most notable is my new cross body bag, which I'll get to in a second. Before I move on to my own purple ensemble, I'd like to first share a humorous anecdote about my husband wearing purple last week. So, last week my husband and I went to the dentist for a routine teeth cleaning. My husband had on a purple check shirt for the "occasion". Upon seeing his shirt, the hygienist assumed that he was wearing the shirt because he was mourning the death of Prince. She then went on to speak quite openly about her love for the musical artist and how she had been wearing purple all week in honor of him. I guess I found this to be amusing because my husband, being a fan of primarily classical music and film scores, doesn't listen to much Prince and our dental hygienist seems like the last person on earth to be a Prince fan, but I guess that just goes to show how far reaching his music is! Getting back to what I am wearing (you know the important stuff! ), I purchased this purple Gucci cross body a few weeks ago because I fell in love with the color. I already have a light purple bag and a bluish/purple bag, but nothing that I would classify as a true purple. So when I saw this bag, I knew I had to get it to "fill in the gap", so to speak, in my collection of purple bags! The hardest decision about purchasing the bag was whether or not to get the clutch style or the camera bag style that you will see featured below. After going back and forth, I opted for the clutch style because it seemed more versatile and could easily be both casual and dressy. 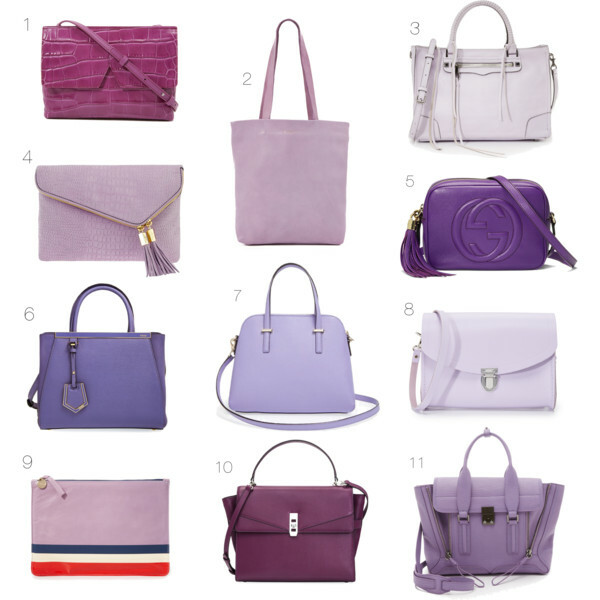 Below you will find a range of other purple options in a variety of shades and styles just in case you too are experiencing some "gaps" in your collection of purple bags or if you are a Prince fan like my dental hygienist! I love that you bought such a classic bag in an unexpected color! Oftentimes women play it too safe with their splurges! That is too funny about your husband and the hygienist--did he play it off like that really was the reason he wore the shirt? An accidental tribute... I love this--stripes and floral are two of my favorite patterns to mix, and I have such a thing for jean jackets. That skirt is so pretty and those shoes add so much delicacy to the full look. I love the rich colors in this outfit. The purple with the teal is stunning! Such a cute story with your husband and yay for splurging, what a cute bag! That is awesome! Funny story about your husband! Loving this purple look! Your bag is gorgeous! Gorgeous outfit! 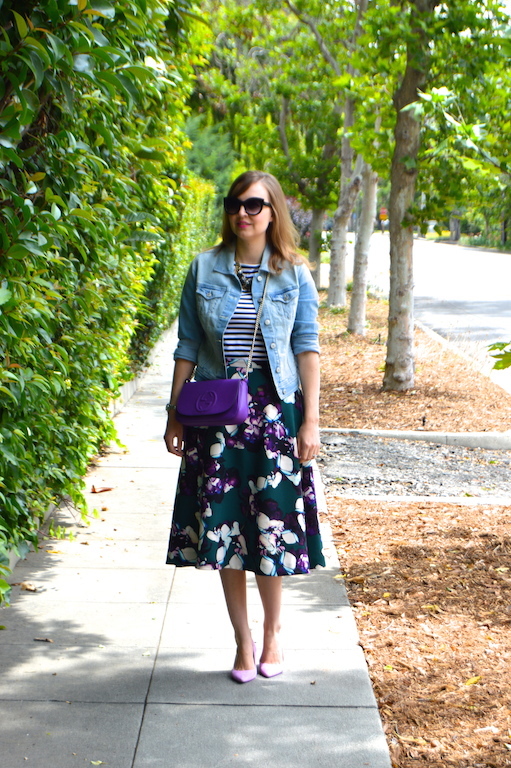 I love the marriage of a floral print skirt and a classic denim jacket. That just sings with the spirit of spring. 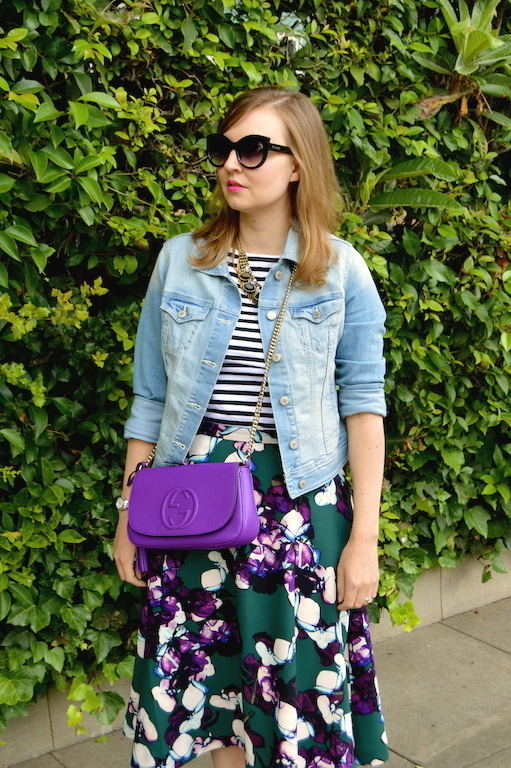 Another stunning floral skirt and A+ on mixing florals with stripes and high with low. I absolutely love your new bag and those shoes. And I need that BR skirt.